Charles Robert Darwin, the official companion of Captain Robert Fitzroy, has entered Ecuadorian waters and officially arrives in the Galápagos Islands on a day like today. How exciting to commemorate today 180 years of Charles Darwin’s visit to the Galápagos Islands. Although, Darwin was not too keen on boats, it was evident that he desperately wanted to go ashore. Maybe as a relief, or as a dream come true, Darwin had finally arrived after sailing from Puerto Callao in Perú for about 8 days of strong winds and seas. He knew the islands were volcanic, and Darwin himself had already big expectations, especially after reading Charles Lyell’s Vol 1 masterpiece – Principles of Geology. It was the local wildlife, however, that impressed Darwin the most. Today, we explore the islands in the same pristine way Darwin did back in 1835. The different itineraries allow explorers to enhance his contributions to science and humankind by simply unfolding the exciting concept of observation. Charles Darwin mastered the technique of observing deeper, further, in detail, and always consistent. Let’s remember first that the HMS Beagle voyage in this area of the world, had nothing to do with the scientific understanding of the Galápagos Islands. Captain Robert Fitzroy commanded one of the most ambitious and revealing surveying maritime trips ever accomplished by the British Royal Navy. Fitzroy was already a master mathematician, and his calculations allowed him draw naval charts as accurate as no other. The economic potential of whaling in Galápagos was connected to understanding the geography of the islands first. With that said, it is easy to understand why Darwin and Fitzroy had their arguments from time to time; Darwin wanted to explore the islands, while Fitzroy wanted to survey and plot the shoreline. Little by little, they managed to get their different goals accomplished. When did Charles Darwin go to the Galapagos? The HMS Beagle and Darwin enter Galápagos waters on September 15th, 1835 and spot first Mount Pitt (Punta Pitt) off the eastern tip of San Cristóbal Island, about 50 miles away in the open ocean. Then, next day, they heavily survey the coast of Hood (Española) Island, and on September 18th, Darwin and John Stokes, assistant surveyor, are authorized to disembark and go ashore at Stephen’s Bay, Chatham Island (San Cristóbal). The first impressions on Darwin are an absolute delight for him: inhospitable black lava next to white-coralline beaches, surrounded by older volcanic features. It seems like Cerro Brujo had been chosen as landing site. Today, we regularly visit this stunning location with our regular itineraries (see picture). As the HMS Beagle continued its surveying voyage, Charles Darwin was authorized to go ashore at other locations. Interestingly, only four islands were physically explored by him: San Cristóbal, Isabela, Floreana, and James. The ship though, did extensive coverage of the islands and that probably gave Darwin a very broad perspective of how different and how similar the islands and their wildlife were. One of the early conclusions he wrote was related to describing each island as a world by itself. Will I see Charles Darwin ghost in the Galápagos Islands? Probably not, but it is always good to look around. Remember he was the one who mastered the Power of Observation, and if you exert that whilst visiting the islands, your view will change the way you see things around you. This is why an expedition in the Galápagos Islands is revealing, exciting, educational, mind boggling, and certainly inspirational. 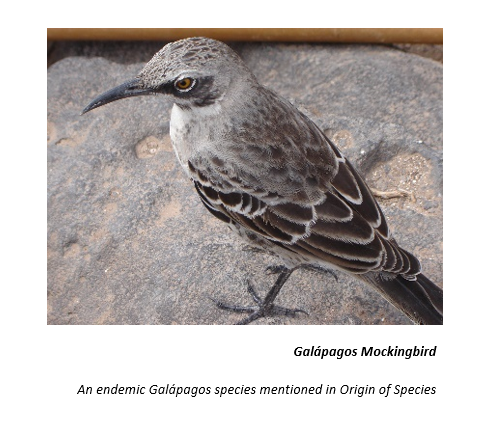 It surely was for Darwin, as his masterpiece, Origin of Species, was written about 25 years later, and although he uses few examples from the Galápagos, it is quite obvious that inspiration is what he got from here. This is why exploring the islands in September and October can be the most glorious way of celebrating the 180th Anniversary of Charles Darwin in the Galápagos Islands.